For example, according to research conducted by scientists at Colorado State University and published in 2005, at least half the US population fails to meet the recommended dietary allowance (RDA) for vitamin B-6, vitamin A, magnesium, calcium, and zinc, and 33% of the population does not meet the RDA for folate. Other studies also show that average vitamin K and D intake levels may be suboptimal as well. TRIUMPH contains 21 vitamins and minerals as well as 14 additional ingredients that improve​ overall health​ ​and​ ​well-being,​ ​enhance​ ​physical​ ​and​ ​mental​ ​performance,​ ​and​ ​protect​ ​against disease. For example, the clinically effective dosages of aged garlic extract, grape seed extract, and N-acetyl L-cysteine improve blood flow, immune cell function, blood glucose control, and liver function, and the rhodiola rosea, bacopa monnieri, and ashwagandha root extract improve exercise performance, cognition and memory performance, and reduce feelings of stress, anxiety, and depression. All that is why TRIUMPH has over 540 reviews from customers on Amazon.com with a 4.5-star average, and another 200+ on our websites, also with a 4.5-star average. What TRIUMPH is not, though, is cheap, so if you’re concerned about the price, I understand--you can get a multivitamin for a bit less. Remember that you get what you pay for, though, so generally speaking, the cheaper a supplement is, the less effective the formulation. Place your order now and if you don’t absolutely love TRIUMPH, just let us know and we’ll give you a full refund on the spot. No complicated forms and no return necessary. You really can’t lose, so order now and get ready to improve the nutritional quality of your diet and your mood and mental and physical performance, and boost your resistance to stress, sickness, and disease. Take 4 capsules, two times daily, with meals. For optimal results, take every day. Check with a qualified healthcare professional before using this product if you are under 18 years of age or if you have any known or suspected medical condition(s) and/or are taking any prescription or OTC medication(s). We aren’t at all concerned with addressing a deficiency in TRIUMPH but instead are looking for possible extra benefits from this molecule. In theory, while the serotonin, dopamine, and testosterone mechanisms may offer benefits, they are not yet proven in humans. We have included additional B6 above the RDA in hopes that these properties, alongside a known yet minor boost in immune function, will occur while staying well below the lowest known case of toxicity reported in the literature (200 mg). Like other water-soluble B vitamins, niacin is essential for the conversion of food into cellular energy. It also helps improve the cholesterol profile and maintain healthy skin, hair, eyes, and liver and nervous system function. Thiamin is a B vitamin that helps with the metabolism of food, and which also plays role in nerve signaling and muscle contraction. As you may know, our body can’t produce vitamin D without sun exposure. When our skin is exposed to the sun’s UVB rays, they interact with a form of cholesterol in the body to produce vitamin D. The more skin that is exposed to the sun, and the stronger its rays, the more vitamin D you produce. Thus, in a way, superloading alpha-tocopherol can be adverse, and we have included other ingredients in TRIUMPH to compensate for the lost antioxidant properties of vitamin E superloading. That said, a lot of people still do not get much vitamin E via the diet due to low intakes of eggs and nuts, and thus supplementation is worthwhile. A mild increase above the RDA is beneficial, but more than 400 IU / day is overkill. 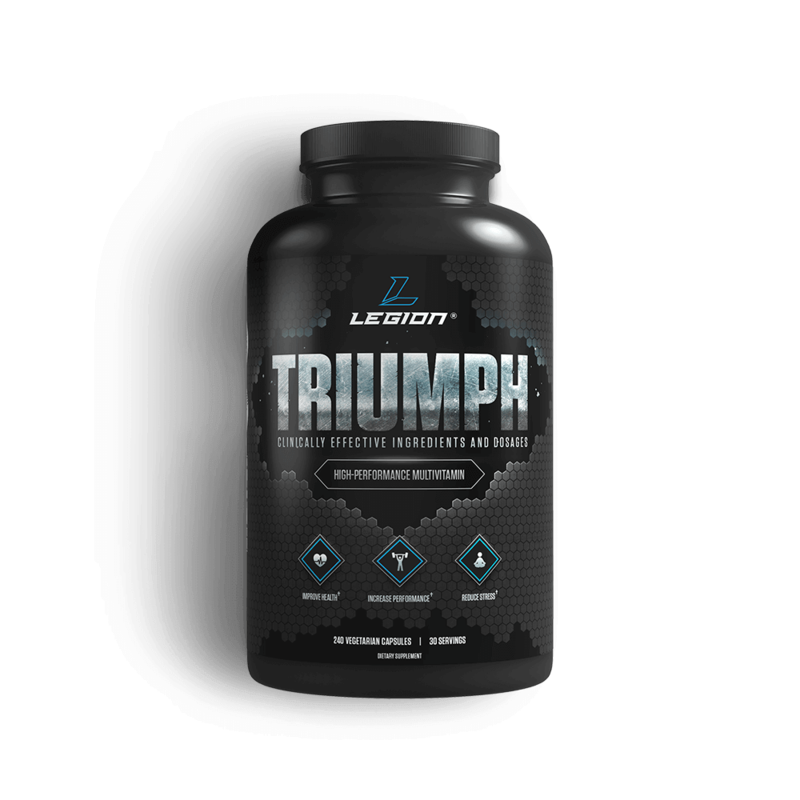 TRIUMPH includes 500 mcg of vitamin K1 to get most of the requirements for optimal levels out of the way and then adds 100 mcg of the highly bioavailable and readily retained vitamin K2 form known as MK-7. These dosages, plus a healthy diet, can bring you to optimal levels. Using high dosages in persons with an already more-than-adequate diet is undesirable, and 25 mcg / day is sufficient for health reasons while also avoiding excess intake when diet is considered. N-acetyl L-cysteine is a form of the amino acid cysteine, and it has been used in conventional medicine for more than 30 years primarily as a mucolytic (mucus thinner) and a way to increase levels of the important antioxidant glutathione molecules that can improve circulation. Like zeaxanthin, research shows that supplementation with lutein improves eye function and preserves eye health. The two tend to be supplemented alongside each other. 01. Origins and evolution of the Western diet: health implications for the 21st century. 02. Vitamin K intake and atherosclerosis. 03. IOF position statement: vitamin D recommendations for older adults. 04. Hypervitaminosis A-induced liver fibrosis: stellate cell activation and daily dose consumption. 06. Synthetic as compared with natural vitamin E is preferentially excreted as alpha-CEHC in human urine: studies using deuterated alpha-tocopheryl acetates. 07. Folate, folic acid and 5-methyltetrahydrofolate are not the same thing. 09. How prevalent is vitamin B(12) deficiency among vegetarians? 10. Treatment of depression: time to consider folic acid and vitamin B12. 11. B-vitamins reduce the long-term risk of depression after stroke: The VITATOPS-DEP trial. 12. Oral folic acid and vitamin B-12 supplementation to prevent cognitive decline in community-dwelling older adults with depressive symptoms--the Beyond Ageing Project: a randomized controlled trial. 13. Association of dietary and supplemental folate intake and polymorphisms in three FOCM pathway genes with colorectal cancer in a population-based case-control study. 14. Safety considerations with niacin therapy. 15. Effect of biotin on hair roots and sebum excretion in women with diffuse alopecia. 16. Vitamin D: importance in the prevention of cancers, type 1 diabetes, heart disease, and osteoporosis. 18. Prevalence and correlates of vitamin D deficiency in US adults. 19. The 2011 report on dietary reference intakes for calcium and vitamin D from the Institute of Medicine: what clinicians need to know. 20. Why the IOM recommendations for vitamin D are deficient. 21. Evaluation, treatment, and prevention of vitamin D deficiency: an Endocrine Society clinical practice guideline. 22. Meta-analysis: high-dosage vitamin E supplementation may increase all-cause mortality. 23. A high phylloquinone intake is required to achieve maximal osteocalcin gamma-carboxylation. 24. The effect of menaquinone-7 supplementation on circulating species of matrix Gla protein. 25. Zinc loss in sweat of athletes exercising in hot and neutral temperatures. 26. The effect of exhaustion exercise on thyroid hormones and testosterone levels of elite athletes receiving oral zinc. 27. Effect of zinc and selenium supplementation on serum testosterone and plasma lactate in cyclist after an exhaustive exercise bout. 28. Electrolyte loss in sweat and iodine deficiency in a hot environment. 29. Effect of chromium on glucose and lipid profiles in patients with type 2 diabetes; a meta-analysis review of randomized trials. 30. Effect of supplementation with chromium picolinate on antibody titers to 5-hydroxymethyl uracil. 31. Aged garlic extract reduces blood pressure in hypertensives: a dose-response trial. 32. Inhibiting progression of coronary calcification using Aged Garlic Extract in patients receiving statin therapy: a preliminary study. 33. Aged garlic extract and coenzyme Q10 have favorable effect on inflammatory markers and coronary atherosclerosis progression: A randomized clinical trial. 34. Beneficial effects of aged garlic extract and coenzyme Q10 on vascular elasticity and endothelial function: the FAITH randomized clinical trial. 35. Aged garlic extract inhibits platelet activation by increasing intracellular cAMP and reducing the interaction of GPIIb/IIIa receptor with fibrinogen. 36. Cholesterol-lowering effect of garlic extracts and organosulfur compounds: human and animal studies. 37. Supplementation with aged garlic extract improves both NK and γδ-T cell function and reduces the severity of cold and flu symptoms: a randomized, double-blind, placebo-controlled nutrition intervention. 38. Aged red garlic extract reduces cigarette smoke extract-induced cell death in human bronchial smooth muscle cells by increasing intracellular glutathione levels. 39. Aged garlic extract may be safe for patients on warfarin therapy. 40. Pycnogenol is investigated for its general health and anti-diabetic properties and its ability to enhance Nitric Oxide, which appears to significantly help erectile dysfunction. 41. Protective effect of grape seed extract against oxidative stress-induced cell death in a staurosporine-differentiated retinal ganglion cell line. 42. The polyphenol-rich extract from grape seeds inhibits platelet signaling pathways triggered by both proteolytic and non-proteolytic agonists. 43. The effect of grape seed extract on cardiovascular risk markers: a meta-analysis of randomized controlled trials. 44. Postprandial blood glucose response to grape seed extract in healthy participants: A pilot study. 45. Proanthocyanidin-rich grape seed extract reduces leg swelling in healthy women during prolonged sitting. 46. Grape seed extract suppresses MDA-MB231 breast cancer cell migration and invasion. 47. Gallic acid is an active component for the anticarcinogenic action of grape seed procyanidins in pancreatic cancer cells. 48. Role of oxidative stress in cytotoxicity of grape seed extract in human bladder cancer cells. 49. N-acetylcysteine improves liver function in patients with non-alcoholic Fatty liver disease. 50. Safety and efficacy of N-acetylcysteine in children with non-acetaminophen-induced acute liver failure. 51. Intravenous N-acetylcysteine improves transplant-free survival in early stage non-acetaminophen acute liver failure. 52. N-Acetylcysteine Attenuates Fatigue Following Repeated-Bouts of Intermittent Exercise: Practical Implications for Tournament Situations. 53. The administration of N-acetylcysteine reduces oxidative stress and regulates glutathione metabolism in the blood cells of workers exposed to lead. 54. Modulation by N-acetylcysteine of lead-induced alterations in rat brain: reduced glutathione levels and morphology. 55. Postprandial LDL phenolic content and LDL oxidation are modulated by olive oil phenolic compounds in humans. 56. Antioxidant activity of olive polyphenols in humans: a review. 57. Bioavailability of phenolics from an oleuropein-rich olive (Olea europaea) leaf extract and its acute effect on plasma antioxidant status: comparison between pre- and postmenopausal women. 58. Effects of orally administered lavender essential oil on responses to anxiety-provoking film clips. 59. The effects of lavender scent on dental patient anxiety levels: a cluster randomised-controlled trial. 60. The effect of lavender aromatherapy on autonomic nervous system in midlife women with insomnia. 61. Does lavender aromatherapy alleviate premenstrual emotional symptoms? : a randomized crossover trial. 62. Lavender essential oil in the treatment of migraine headache: a placebo-controlled clinical trial. 63. Effects of chronic Rhodiola Rosea supplementation on sport performance and antioxidant capacity in trained male: preliminary results. 65. The effects of an acute dose of Rhodiola rosea on endurance exercise performance. 66. Clinical trial of Rhodiola rosea L. extract SHR-5 in the treatment of mild to moderate depression. 67. Herbal medicines, other than St. John's Wort, in the treatment of depression: a systematic review. 68. Rhodiola inhibits dengue virus multiplication by inducing innate immune response genes RIG-I, MDA5 and ISG in human monocytes. 69. Therapeutic effects and safety of Rhodiola rosea extract WS® 1375 in subjects with life-stress symptoms--results of an open-label study. 70. Effects of a standardized Bacopa monnieri extract on cognitive performance, anxiety, and depression in the elderly: a randomized, double-blind, placebo-controlled trial. 71. Meta-analysis of randomized controlled trials on cognitive effects of Bacopa monnieri extract. 72. Does Bacopa monnieri improve memory performance in older persons? Results of a randomized, placebo-controlled, double-blind trial. 73. Effects of 12-Week Bacopa monnieri Consumption on Attention, Cognitive Processing, Working Memory, and Functions of Both Cholinergic and Monoaminergic Systems in Healthy Elderly Volunteers. 74. The cognitive-enhancing effects of Bacopa monnieri: a systematic review of randomized, controlled human clinical trials. 75. An acute, double-blind, placebo-controlled cross-over study of 320 mg and 640 mg doses of Bacopa monnieri (CDRI 08) on multitasking stress reactivity and mood. 76. Effects of a standardized Bacopa monnieri extract on cognitive performance, anxiety, and depression in the elderly: a randomized, double-blind, placebo-controlled trial. 77. Augmentation and proliferation of T lymphocytes and Th-1 cytokines by Withania somnifera in stressed mice. 78. "A standardized Withania somnifera extract significantly reduces stress-related parameters in chronically stressed humans: a double-blind, randomized, placebo-controlled study." (2008). 79. A double-blind, placebo-controlled evaluation of the anxiolytic efficacy ff an ethanolic extract of withania somnifera. 80. Naturopathic care for anxiety: a randomized controlled trial ISRCTN78958974. 81. Clinical Evaluation of the Spermatogenic Activity of the Root Extract of Ashwagandha (Withania somnifera) in Oligospermic Males: A Pilot Study. 82. In vivo effects of Ashwagandha (Withania somnifera) extract on the activation of lymphocytes. 83. Effects of eight-week supplementation of Ashwagandha on cardiorespiratory endurance in elite Indian cyclists. 84. Withania somnifera reverses Alzheimer's disease pathology by enhancing low-density lipoprotein receptor-related protein in liver. 86. Terminalia arjuna reverses impaired endothelial function in chronic smokers. 87. Inhibitory effects of Terminalia arjuna on platelet activation in vitro in healthy subjects and patients with coronary artery disease. 88. Effects of Withania somnifera (Ashwagandha) and Terminalia arjuna (Arjuna) on physical performance and cardiorespiratory endurance in healthy young adults. 89. Aqueous extract of Terminalia arjuna attenuates tert-butyl hydroperoxide-induced oxidative stress in HepG2 cell model. 90. Pentacyclic triterpenes from Terminalia arjuna show multiple benefits on aged and dry skin. 91. Cissus quadrangularis reduces joint pain in exercise-trained men: a pilot study. 92. Anti-inflammatory effect of ethyl acetate extract from Cissus quadrangularis Linn may be involved with induction of heme oxygenase-1 and suppression of NF-κB activation. 95. Free radical scavenging profile and myeloperoxidase inhibition of extracts from antidiabetic plants: Bauhinia forficata and Cissus sicyoides. 96. Coenzyme Q(10) improves endothelial dysfunction of the brachial artery in Type II diabetes mellitus. 97. Coenzyme Q10 improves endothelial dysfunction in statin-treated type 2 diabetic patients. 98. Effects of coenzyme Q(10) on LDL oxidation in vitro. 99. Protective effects of in vitro treatment with zinc, d-aspartate and coenzyme q10 on human sperm motility, lipid peroxidation and DNA fragmentation. 100. Effects of coenzyme Q10 supplementation (300 mg/day) on antioxidation and anti-inflammation in coronary artery disease patients during statins therapy: a randomized, placebo-controlled trial. 101. Coenzyme Q10 in the treatment of hypertension: a meta-analysis of the clinical trials. 102. Can coenzyme q10 improve clinical and molecular parameters in fibromyalgia? 103. Oxidative stress correlates with headache symptoms in fibromyalgia: coenzyme Q₁₀ effect on clinical improvement. 104. The effects of Xanthigen in the weight management of obese premenopausal women with non-alcoholic fatty liver disease and normal liver fat. 105. Fucoxanthin from edible seaweed, Undaria pinnatifida, shows antiobesity effect through UCP1 expression in white adipose tissues. 106. Anti-obesity and anti-diabetic effects of fucoxanthin on diet-induced obesity conditions in a murine model. 107. Fucoxanthin exerts differing effects on 3T3-L1 cells according to differentiation stage and inhibits glucose uptake in mature adipocytes. 108. Long term effects of lutein, zeaxanthin and omega-3-LCPUFAs supplementation on optical density of macular pigment in AMD patients: the LUTEGA study. 109. Secondary analyses of the effects of lutein/zeaxanthin on age-related macular degeneration progression: AREDS2 report No. 3. 110. A dose-response meta-analysis of dietary lutein and zeaxanthin intake in relation to risk of age-related cataract. 111. Plasma lutein and zeaxanthin and the risk of age-related nuclear cataract among the elderly Finnish population. 112. Improvement of retinal function in early age-related macular degeneration after lutein and zeaxanthin supplementation: a randomized, double-masked, placebo-controlled trial. 113. Effect of lutein and zeaxanthin on macular pigment and visual function in patients with early age-related macular degeneration. 114. The effects of a lutein-based supplement on objective and subjective measures of retinal and visual function in eyes with age-related maculopathy -- a randomised controlled trial. 115. Dietary and lifestyle risk factors associated with age-related macular degeneration: a hospital based study.